Marmot minutes: Welcome back Dana! This is Dana, back for a third summer because once RMBl has you, it doesn’t let you go. For those who don’t know me, I am now a second year PhD Candidate at UCLA. 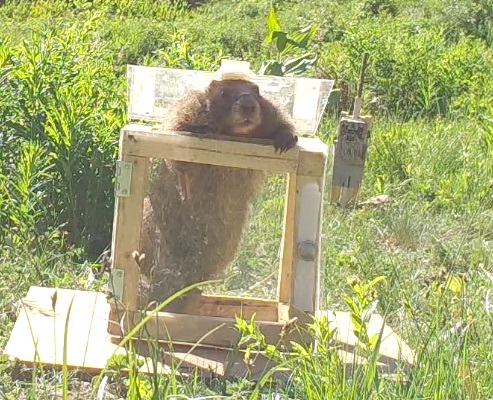 My dissertation works focuses on innovation and social learning in the marmots, which I test by giving the marmots puzzle boxes to solve. This year, I am the field manager and I’m really looking forwards to working with our new crew. So far, the weather has been interesting- this year almost had the lowest snow fall since billy barr has been recording (check his daily and seasonal gothic weather @ gothicwx.org) and almost all of down valley is already melted out. As per usual, I have spent most of my time up valley at Picnic and over the past week we’ve had over 20 marmots emerge! We were concerned that the low snowpack would impact their overwinter survival, but so far it looks like our fears may have been unfounded. Things are ramping up fast this year, but still excited to see all our old marmot friends and meet some new ones in June! Hey, let us try some of those puzzle boxes. If Warren can operate an Android fone, he puzzle out a little box. Especially if it has food in it!